Kst is the fastest real-time large-dataset viewing and plotting tool available (you may be interested in some benchmarks) and has built-in data analysis functionality. Kst contains many powerful built-in features and is expandable with plugins and extensions (see developer information in the "Resources" section). Kst is licensed under the GPL, and is as such freely available for anyone. What's more, as of 2.0.x it is available on all of the following platforms: Microsoft Windows, Linux, Mac OSX. See the "Downloads" section for pre-compiled executables or the sources. Robust plotting of live "streaming" data. Powerful keyboard and mouse plot manipulation. Powerful plugins and extensions support. 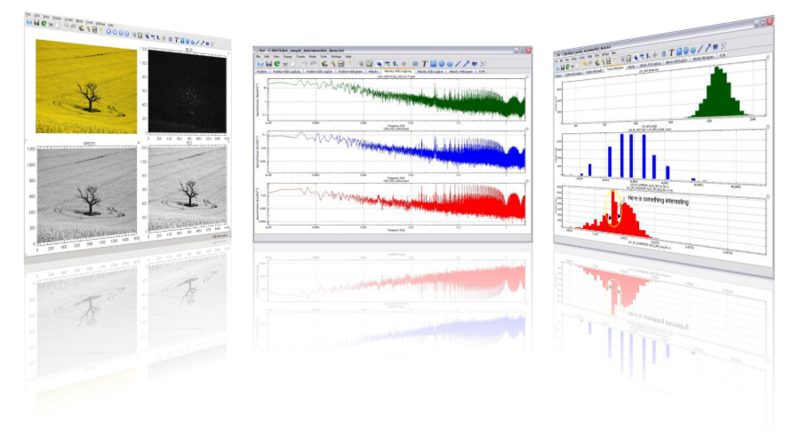 Large selection of built-in plotting and data manipulation functions, such as histograms, equations, and power spectra. Color mapping and contour mapping capabilities for three-dimensional data, as well as matrix and image support. Built-in filtering and curve fitting capabilities. Powerful graphical user interface with non-modal dialogs for an optimized workflow. Support for several popular data formats. Extended annotation objects similar to vector graphics applications. High-quality export to bitmap or vector formats. Fully scriptable in python (beta available under linux). Generally speaking, a good place to ask for advice is the mailing list. Kst supports : ASCII, Dirfile/Getdata, netCDF including metadata, CFitsIO, QImage-compatible image types and Matlab's .mat format with support from the matio library. It does not take a very experienced programmer to customize Kst to your needs. Python can be used to set up sessions instead of the UI. Python can be used to control a kst session. numpy arrays can be transfered into and out of kst, so kst can be easily used along with python. To use python scripting, you will need the very latest version of kst2, and the corresponding pykst.tgz. To date, pykst has only been tested on linux. kst python documentation is available here.